Each project has its own log file that is automatically created if it doesn't exist when the project is created or opened. The Log File is a database which stores detailed information of previous builds and also a summary record of all past builds for the particular project. It is important to decide how many detailed logs you want to store in the log file, as this makes a significant difference to the size of the log file on disk if you have a large project. There are three pages of logging options. By default, Static logging is used. This means that when a project is run, all events are written to the project's log file, but they are only displayed on the Build Log tab when the project stops. Alternatively, Live logging means that as each event occurs, the Build Log tab is updated. This is useful for debugging, but is much slower, especially when running large numbers of quick actions. • Switch to Build Log tab on Run if live logging enabled: Automatically switches to the Build Log tab when performing a run, if using live logging. This is a general convenience for you. These options filter the amount of information displayed in the log. All information that the action generates is always stored in the log. Each action is responsible for tagging a status message with either Success, Information, Warning or Error. It's possible that some actions may not correctly tag the message, especially actions that rely on a 3rd party executables as it can be difficult to detect if certain command line output are errors or informational for example. • Success: Action messages with status of Success are displayed in the log. Success messages are displayed in green. • Information: Action messages with status of Information are displayed in the log. Informational messages are displayed in black. • Warnings: Action messages with status of Waning are displayed in the log. Warning messages are displayed in orange. • Errors: Action messages with status of Error are displayed in the log. Error messages are displayed in red. You should normally leave this enabled. • Hierarchical: Text from actions can be shown in a tree structure, representing different kinds of information such as output, text created by the action itself etc. • Flat: All text from an action is displayed in a single flat list. Show Hidden Actions: Displays "hidden" actions in the log if they execute in error. 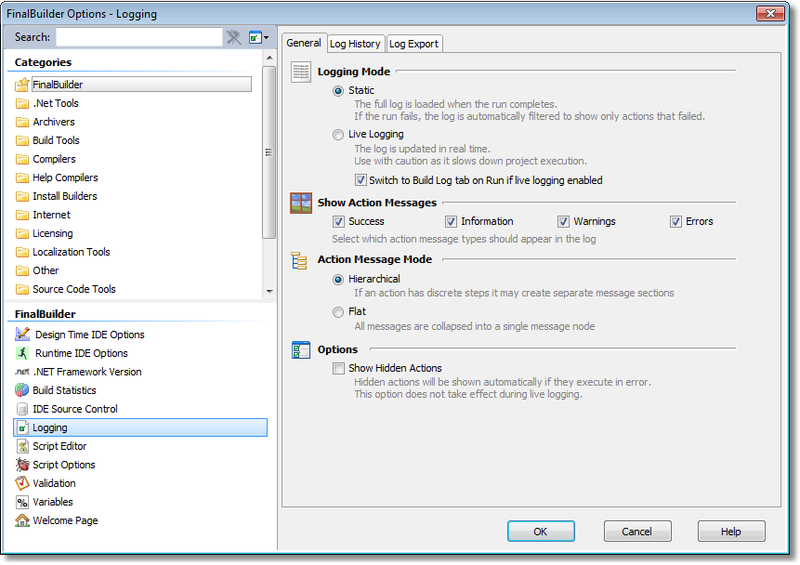 See Action logging properties for information on hidden actions. 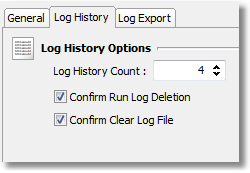 • Log History Count: The maximum number of detailed logs to store in the log file. Increasing this number gives you more history, but a larger log file. This number has no effect on build statistics. • Confirm Run Log Deletion: A confirmation dialog is shown if a log is manually deleted in the Run History. • Confirm Clear Log File: A confirmation dialog is shown if the Clear History option is pressed in the Run History. 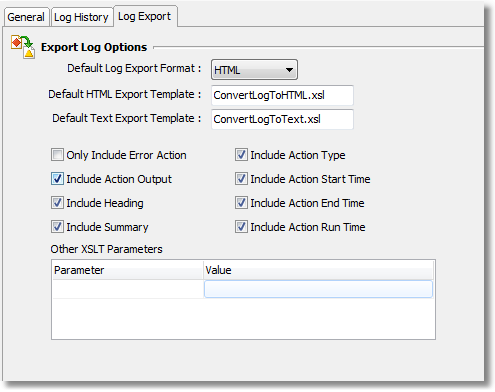 These options control how logs are exported from the History & Statistics tab. They are equivalent to the options on the Export Log Action. • Options: The level of detail to include in the exported log. • Other XSLT Parameters: if you are using your own template stylesheet, then you can provide extra XSLT parameters to control the transformation.